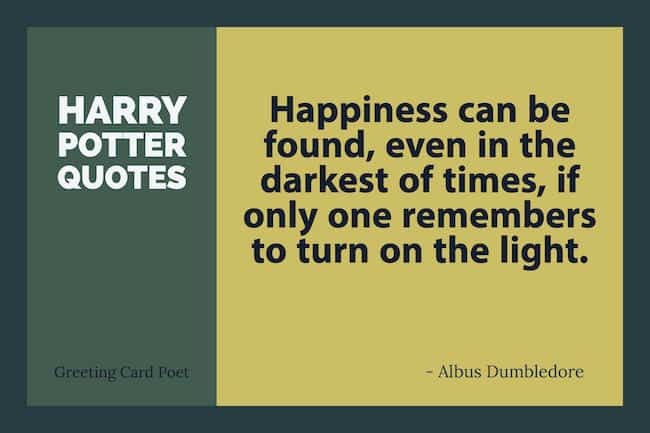 In the series of instant-classic books and blockbuster movies, many Harry Potter quotes stand out for their insight, wit and inspiration. Very few works of fiction have come close to Harry Potter in reach out to tender hearts all across the world. J.K. Rowling has given some of the most gripping and enchanting stories of adventure that have obsessed not just the young, but even adults. These are stories of heroism, inspiration, greatness, love and care, friendship, and the victory of the good over evil. I’ll stay with you…until the very end. 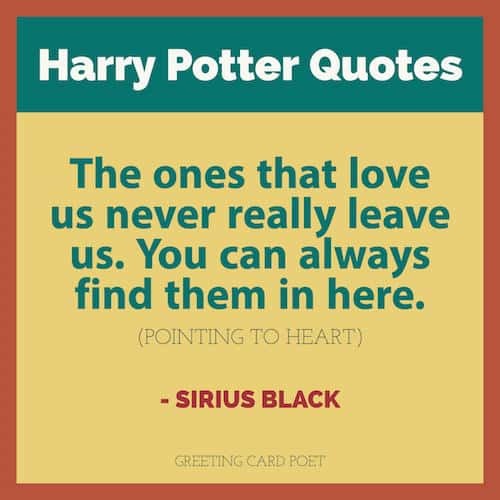 The ones that love us never really leave us. You can always find them, in here. Voldemort: The old argument, he said softly. But nothing I have seen in the world has supported your pronouncements that love is more powerful than my kind of magic, Dumbledore. Dumbledore: Perhaps you have been looking in the wrong places. Dumbledore would have been happier than anybody to think that there was a little more love in the world. What do I care how he looks? I am good-looking enough for both of us, I think! All these scars show is at my husband is brave! I hope you’re pleased with yourselves. 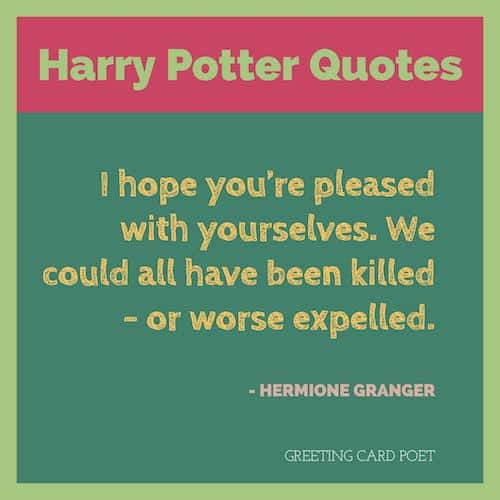 We could all have been killed – or worse expelled. 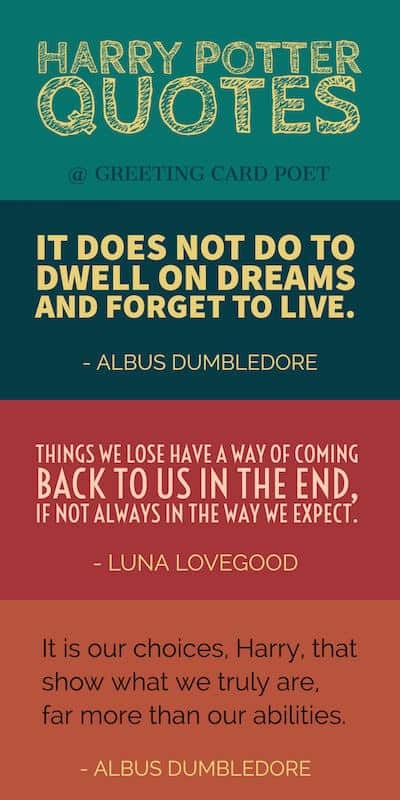 Tip: These Harry Potter quotes make nice photo captions on social media. The poor toilet’s never had anything as horrible as your head down it — it might be sick. Really, Hagrid, if you are holding out for universal popularity, I’m afraid you will be in this cabin for a very long time. Hermione: Ancient Egyptians used to worship cats, you know. Ron Weasley: Yeah, along with the dungbeetle. Anyone can speak Troll, All you have to do is point and grunt. Poor old Snuffles. He must really like you, Harry… Imagine having to live off rats. We must try not to sink beneath our anguish…but battle on. Tip: Check out J.K. Rowling’s Pottermore website. Wit beyond measure is a man’s greatest treasure. I think I’ll just go down and have some pudding and wait for it all to turn up — it always does in the end. It is important, to fight, and fight again, and keep fighting, for only then could evil be kept at bay, though never quite eradicated. The world isn’t split into good people and Death Eaters. We’ve all got both light and dark inside us. What matters is the part we choose to act on. That’s who we really are. If you have any suggestions for additions to our Harry Potter quotes, please let us know via the Contact page. Thanks!